Mike Driscoll explains the code coverage tool coverage.py, how to use it, and provides some simple demos. The -m flag tells coverage.py that you want it to include the Missing column in the output. If you omit the -m, then you’ll only get the first four columns. What you see here is that coverage ran the test code and determined that I have only 67% of the mymath module covered by my unit test. The “Missing” column tells me what lines of code still need coverage. If you look at the lines coverage.py points out, you will quickly see that my test code doesn’t test the subtract, multiply or divide functions. This screenshot clearly shows what parts of the code were not covered in our original unit test. Now that we know definitively what’s missing in our test coverage, let’s add a unit test for our subtract function and see how that changes things! This is an 11% improvement! Let’s go ahead and add a simple test for the multiply and divide functions and see if we can hit 100% coverage! As you can see, we have hit full test coverage! Of course, full coverage in this case means that each function is exercised by our test suite. The problem with this is that we have three times the number of tests for the addition function versus the others, but coverage.py doesn’t give us any kind of data about that. However it will give us a good idea of basic coverage even if it can’t tell us if we’ve tested every possible argument permutation imaginable. I just wanted to mention a few other features of coverage.py without going into a lot of detail. First, coverage.py supports configuration files. The configuration file format is your classic “.ini” file with sections demarcated by the fact that they are surrounded with square braces (i.e. [my_section]). You can add comments to the config file using the following # or ; (semi-colon). Coverage.py also allows you to specify what source files you want it to analyze via the configuration file we mentioned previously. Once you have the configuration set up the way you want it, then you can run coverage.py. It also supports a “–source” command-line switch. Finally you can use the “–include” and “–omit” switches to include a list of file name patterns or exclude them. These switches have matching configuration values that you can add to your configuration file too. The last item that I want to mention is that coverage.py supports plugins. You can write your own or download and install someone else’s plugin to enhance coverage.py. You now know the basics of coverage.py and what this special package is useful for. 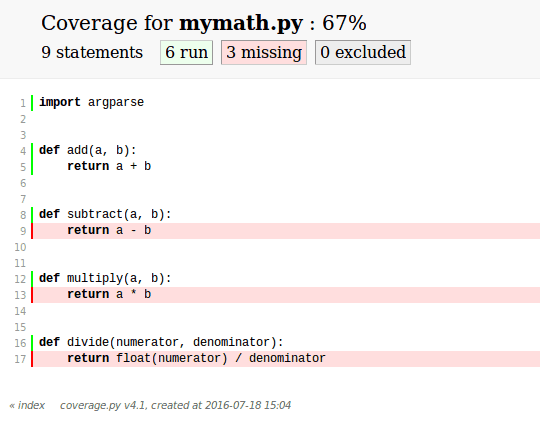 Coverage.py allows you to check your tests and find holes in your test coverage. If you aren’t sure you’ve got your code tested properly, this package will help you ascertain where the holes are if they exist. Of course, you are still responsible for writing good tests. If your tests aren’t valid but they pass anyway, coverage.py won’t help you.